Until Prohibition New York was known for its rye whiskey. This feisty spirit was the basis for the legendary MANHATTAN cocktail, made famous by Jenny Churchill (Winston’s Mum). Rye had not been produced in New York for over 80 years, but Tuthilltown Spirits’ HUDSON MANHATTAN RYE WHISKEY signals the return of the quintessential New York Whiskey. Our rye is made from whole grain rye one batch at a time. It is not the blended rye whiskey your parents used to mix with soda. This is honest rye whiskey. 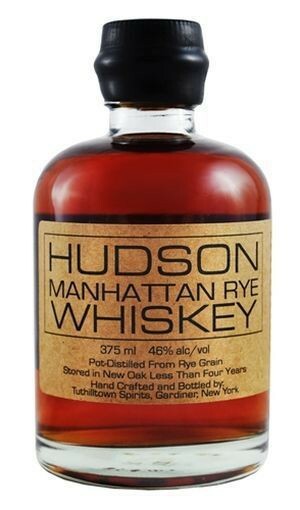 HUDSON MANHATTAN RYE is bottled at 92 proof. It is fruity, floral and smooth, with a recognizable rye edge that leaves no doubt the origin of the spirit. Each bottle is hand filled, capped, waxed and numbered. Enjoy the return of this classic American spirit.